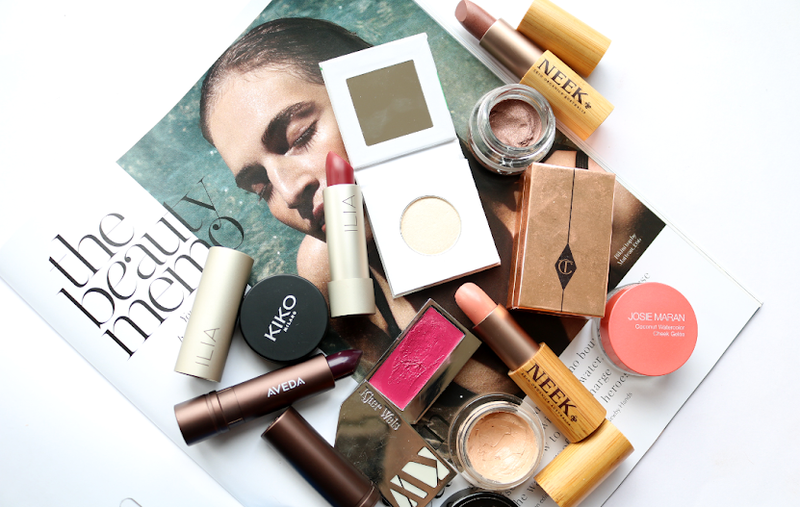 ILIA are one of those very few organic beauty, high-end makeup brands that have managed to creep onto many bloggers wishlists alongside the likes of mainstream favourites such as Charlotte Tilbury and Illamasqua. ILIA are a Los Angeles-based brand who have been challenging the public's perceptions of organic beauty for a number of years now, and I first discovered them back in 2014 where I fell in love with their gorgeous lipsticks and that effortlessly stylish, but still eco-friendly, recycled aluminium packaging. They're cruelty-free and create their products from formulas which are made up of up to 85% bioactive organic ingredients and are free from parabens, silicones, petrochemicals, carmine, and synthetic preservatives. 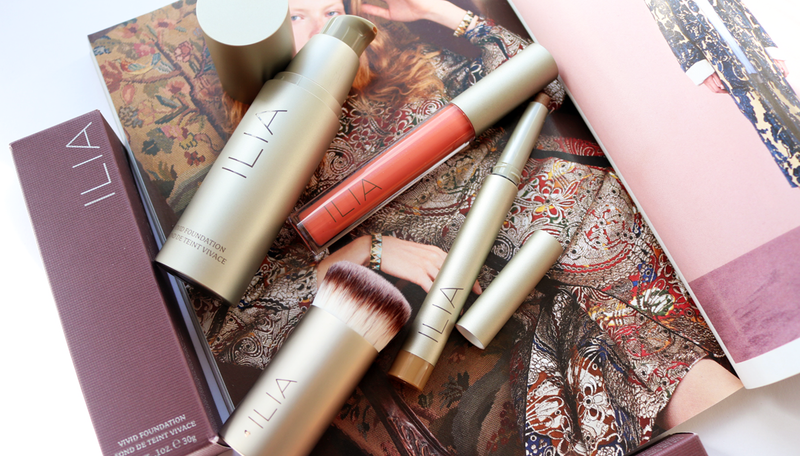 Originally famed for their lipsticks and tinted lip conditioners, ILIA have really branched out in the last year or so and have gone on to release a whole bunch of shiny new products in order to compile an exciting, contemporary organic makeup range. Needless to say, many of their products have since caught the attention of my own personal wishlists, and I'm thrilled to be able to finally try out a few more pieces from them! 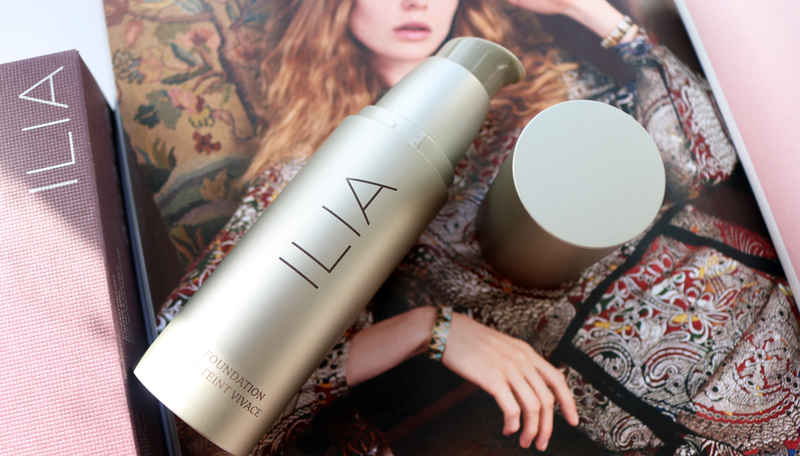 This is ILIA's first liquid foundation and staying true to the brand's ethos, it's packed full of natural and nourishing botanical ingredients to offer consumers that coveted holy grail which is 'makeup with skincare benefits'. It's packaged in a sleek container with a pump, and it's easy to dispense exactly how much you need. This foundation has a 'softly whipped' formula that's a dream to work with as it's really easy to blend with and allows you to build it up to full coverage if desired. It's a very moisturising foundation though, thanks to ingredients such as Coconut Oil, Sunflower Seed Oil and Rosehip Oil all being high up on the INCI list, but my combination skin has been enjoying it so far and I imagine that dry and mature skin types will absolutely love it even more! It gives me a softly dewy, glowy finish that looks like healthy, fresh, real skin, and I've found that I don't need to use a lot of it to give me the medium amount of coverage that I want. As it's so moisturising, I do have to set it with a little translucent powder to keep my oily t-zone in check, however I have to say that this is one of the best liquid foundations that I've ever tried from a green/organic beauty brand. It wears so well throughout the day and is great for perking up dull skin as it doesn't make look flat or cakey. There are currently six shades available and my shade is F3 Santorini which is suitable for light-medium skin tones with neutral undertones. 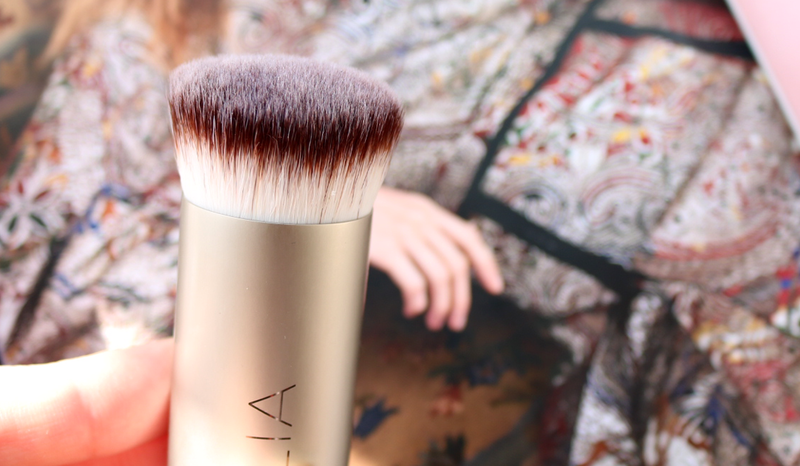 To apply the Vivid Foundation, I've been using ILIA's Perfecting Buff Brush which looks like a bit like a Kabuki brush, but one that has a short, densely packed head. The bristles are made from high-quality, cruelty-free, synthetic Taklon fibres, and this brush works perfectly with any liquid or cream based foundation. 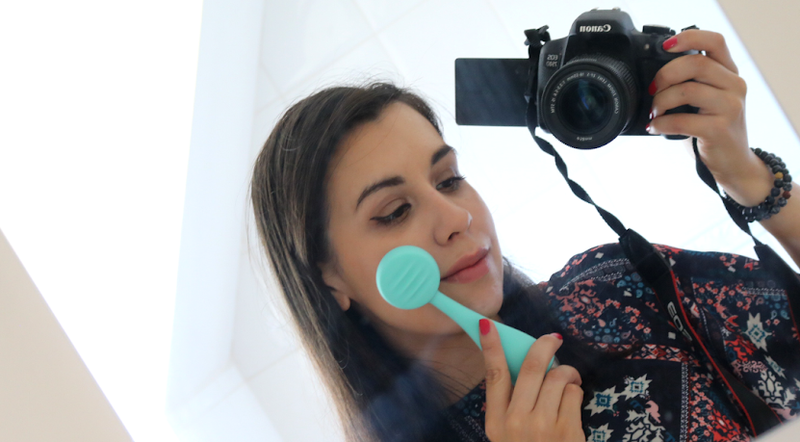 It really does what it says it'll do as it perfectly buffs any base production into the skin for a beautiful, flawless looking finish and the bristles feel so nice and soft. A new favourite for sure and I love how cute and compact it is as it's ideal for throwing into your travel bag. 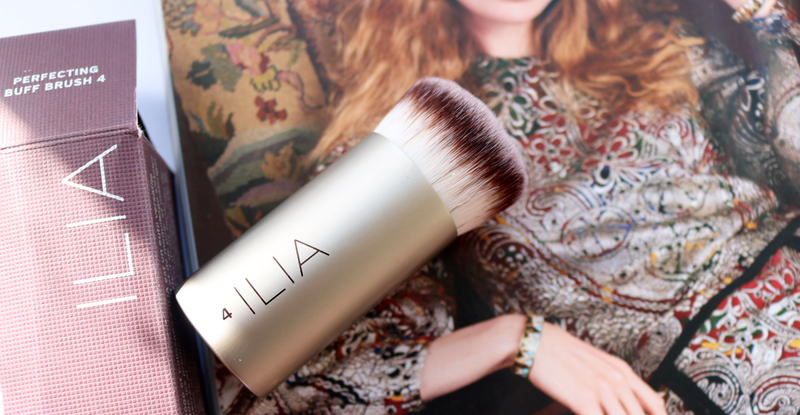 If you're not a fan of these kinds of buffing brushes, ILIA also have an interesting angled/pointed tip Foundation Brush with a more traditional, longer handle that you could try instead. 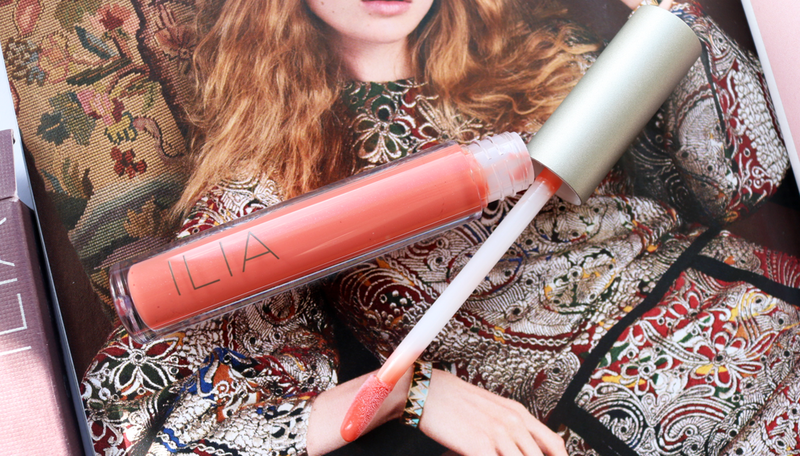 As I've been a huge fan of ILIA's Lipsticks and Tinted Lip Conditioners, I've always found myself overlooking their lip glosses in favour of just picking up a new lippie, but since trying this one out, I I'll have to have a proper look into them now! These lip glosses feel wonderfully nourishing on my dry lips as they contain hydrating ingredients such as Coconut Oil, Shea Butter and Vitamin E, and they don't have any distinguishable flavour to them. I have the shade The Butterfly And I which gives a subtle and sheer wash of light peach to the lips. A really pretty, natural looking, everyday sort of shade that you can apply on the go without needing to worry about it looking messy. It doesn't feel thick or sticky at all, so it doesn't last long, but it's something that I don't mind re-applying. 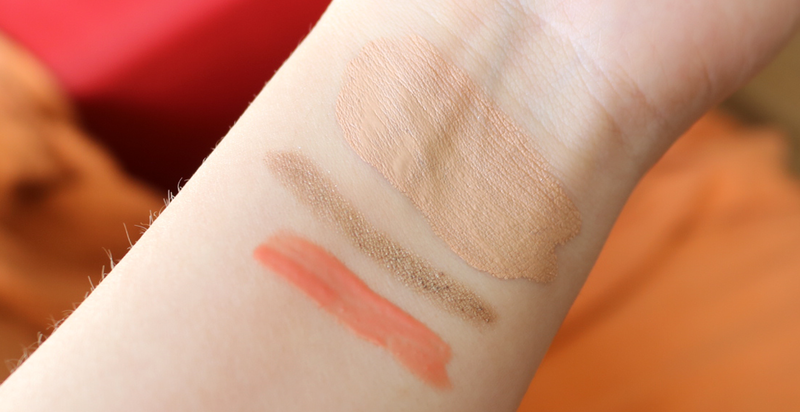 I think this shade would be really flattering on lots of different skin tones! Twist-up cream eyeshadow sticks like these are my go-to when I'm in a rush in the morning and running late because they're so easy to apply. ILIA's Silken Shadow Sticks are no exception and they're the perfect product to reach for if you're after a simple but pretty hint of metallic colour on the lids. 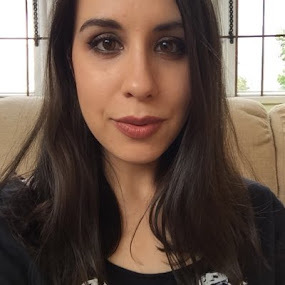 Like much of ILIA's makeup, they're formulated with lots of nourishing ingredients like Argan Oil, Sesame Oil, Shea Butter, Rosehip Oil and Coconut Butter, which makes them apply smoothly and allows you to blend them with just your fingertips if you want a really quick eye base. There are currently six shades available and I chose In Between Days because I'm obsessed with these warm, golden tones for a fuss-free, one-colour-all-over-the-lid look. However, I did find that it started to crease on me after around 5-6 hours of wear, so I'd recommend slapping on a good eyeshadow primer before applying it if you have oily lids like I do. Swatches! From top to bottom: ILIA Vivid Foundation in F3 Santorini, Silken Shadow Stick in In Between Days & Lip Gloss in The Butterfly And I. 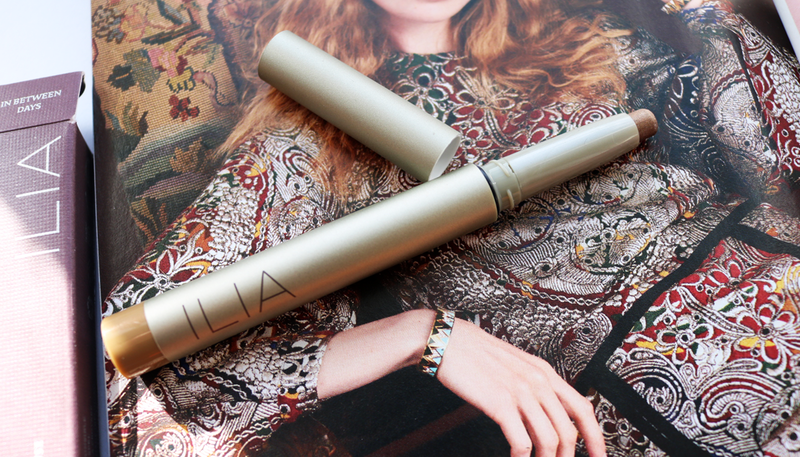 Have you tried any ILIA makeup? I love a nice lip gloss - The Butterfly And I colour is really pretty. I think I’ll go for Heart Beat and Peek A Boo too! I had a look at the full ingredients list for the Ilia lip glosses. You mention that Ilia are free from harmful ingredients like carmine, parabens, and silicones. Just to add to that point, the glosses are also free from beeswax and lanolin oil (sheep glands)! 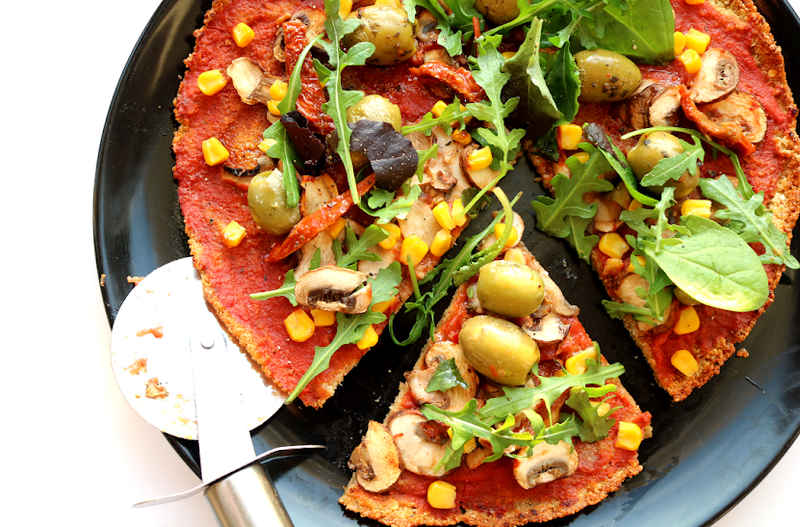 Great for vegans!